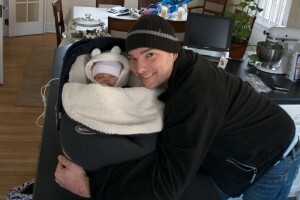 « Happy Birthday Kate – Two Months Old! 11 Pounds, 12 Ounces & 24 Inches Tall…and her First Shots! Kate had her two month checkup with the Pediatrician this morning. Mom and dad have been worried about this visit for a while because we knew Kate would be getting her first shots and were afraid for her! The doctor gave us some Tylenol on the first visit back in November and told us to give her 0.6 mL before her visit. We did as instructed and brought Kate to the doctor’s office. Kate was weighed and measured, then the doctor came in and gave her a look over. Mom had written all her questions down, so the doctor answered all her questions while he looked in Kate’s mouth, ears, and eyes. Kate was given a clean bill of health – she’s happy and healthy! Happy and healthy are great, but we knew the worst was coming. The doctor was about to leave, and we shouted “No Shots?”…he smiled and said “I’m the good cop…the bad cop does the shots”. The nurse entered soon enough to give Kate her shots. Mom sat down away from the action while I entertained Kate during the shots. The nurse gave kate a shot in each thigh while Kate’s head began to turn red and her bottom lip started to curl…and she took a deep breath and started crying. Dad held her hands close and kissed her…and she stopped crying! (good thing…because Dad could feel tears developing in his eyes). Kate was a little fussy while we were dressing her…but other than that – smooth sailing. She looked at us as if to say – I knew it was not gonna be a big deal! This entry was written by John, posted on January 8, 2009 at 12:27 pm, and filed under Uncategorized.